In mid February 2012 a poacher was shot and killed after a gun battle with game rangers at the Hwange National Park. The poachers dehorned a black rhino and disappeared into the bush leaving the bull to bleed to death in a ditch. National Parks Rangers called for the support of Zambezi Helicopter Company. ZHC swiftly sent a helicopter to Hwange National Park where they assisted with the pursuit but regrettably the remaining poachers escaped. A ‘shoot to kill’ policy has been adopted by several African countries but does not seem to deter these brutal poachers. 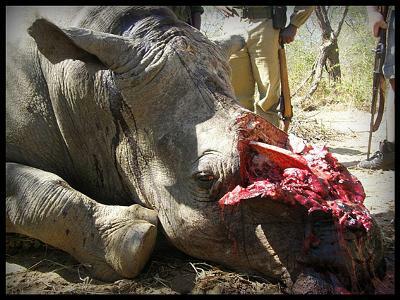 In South Africa alone, in 2011, 443 rhino have been poached. This is a rate of 1 rhino illegally killed every 20 hours. Fueled by insatiable Asian demand, a rhino horn is worth more than its weight in gold, valued at around $50000 per Kg. There is a war out there, which threatens the Black Rhino with extinction and it is encroaching on Victoria Falls. There is a Rhino Breeding Program pioneered by Shearwater and property owners Rani Resorts. It is a flagship conservation project situated on the Vic Falls Private Game Reserve and is now home to a crash of 6 black rhinos, 3 of which were born on the reserve. These are the only remaining Black Rhino in the proximity of Victoria Falls and this remains a rare success story in the fight against poaching. Book a game drive with Shearwater and enjoy the rare opportunity of a close encounter with these majestic but highly endangered animals in their natural habitat. The Rhino are sighted on 97% of the game drives and 10% of the Game Drive price is contributed directly to the protection and preservation of these Black Rhino.